A voltage regulator is a device, or combination of devices. designed to maintain the output voltage of a power supply as nearly constant as possible. It can be regarded as a closed-loop control system because it monitor, output voltage and generates feedback that automatically increases or decreases t he supply voltage, as necessary, to compensate for any tendency of the output tv change. Thus, the purpose of a regulator is to eliminate any output voltage variation that might otherwise occur because of changes in load, changes in line (input) voltage, or changes in temperature. Regulators arc constructed in numerous circuit configurations, ranging from one or two discrete components to elaborate integrated circuits. One of the simplest discrete regulators consists of only a resistor and a zcner diode. We will study that circuit in detail in Chapter 18, but since zener diodes are also . 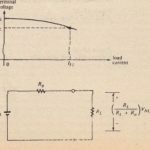 used in the more complex regulators that are the subject of our present discussion, we will preview the principal feature that makes them useful as voltage references. Figure 17-27 shows the /- V characteristic of a typical zener diode. Notice that the forward-biased characteristic is the same as that of a conventional diode. However, the zcncr is normally operated in its reverse-biased, breakdown region, which is the nearly vertical line drawn downward on the left side of the figure. The diode is manufactured to have a specific breakdown voltage, called the zener voltage Vz, which may be as small as a few volts. 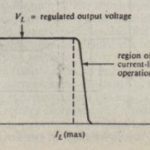 The important point to notice is that the nearly vertical breakdown characteristic implies that the voltage Vz across the diode remains substantially constant as the (reverse) current through it varies over a wide range. It therefore behaves much like an ideal voltage source that maintains a constant voltage independent of current. 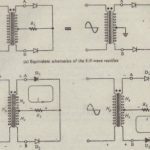 For this reason, the zener diode can be operated as an essentially constant voltage reference in regulator circuits, provided it remains in breakdown. Voltage regulators may be classified as being of either a series or a shunt design. 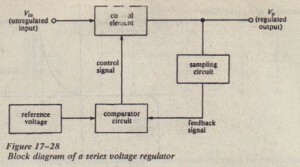 a functional block diagram of the series-type regulator. 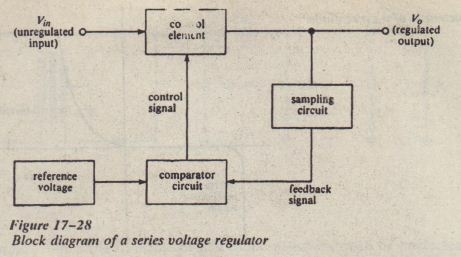 While the individual components shown in the diagram may not be readily identifiable in every series regulator circuit, the functional block diagram serves as a useful model for understanding the underlying principles of series regulation. V;,. is an unregulated dc input, such as might be obtained from a rectifier with a capacitor filter. and is the regulated output voltage. Notice IIl:11 the (01′ (/1/ element, vhich is a dcvir£!. 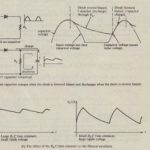 whose operating st ••te adjusts as necessary In maintain a constant is in a series path between ViII and V”, A sampling circuit prouuces a feedback voltage proper tional to Vo and this voltage is compared to a reference voltage. The output of the circuit is the control signal that adiusts the operating state of the control element. If Vo decreases, due, for example, to an increased load, then the comparator produces an output that causes the control element to increase Vo. 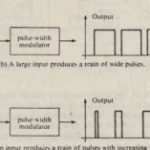 In other words, Vo is automatically raised until the comparator circuit no longer detects any difference between the reference and the feedback. Similarly, any tendency of Vo to increase results in a signal that causes the control element to reduce Vo. A simple transistor voltage regulator of the series type. 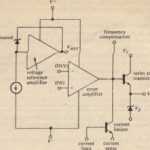 Here, the control element is the NPN transistor, often called the pass transistor because it.” passes, all the load current through the regulator. It is usually a power transistor, and it may be mounted on a heat ~iilk in -duty power supply that delivers substantial current. The zener diode provides the voltage reference, and the base-to-emitter voltage of the. transistor is the control voltage. In this case there is no identifiable sampling circuit, since the entire output voltage level V” is used for feedback. Notice that the zener diode is reverse biased and that reverse current is furnished to it through resistor R. Although Vill is unregulated, it must remain sufficiently large, and R must be sufficiently small, to keep-the zener in its reverse breakdown region, as shown in Figure 17-27. Thus, as the unregulated input voltage varies, Vz remains essentially constant. Writing Kirchhoff’s voltage law around the output loop, we find We now treat Vz as perfectly constant. Since (17-37) is valid at all times, any change in Vo must cause a change in VBE, to maintain the equality. For example, if Vo decreases, VBE must increase since Vz is constant. Similarly, if Vo increases, V6£ mus decrease. The behavior we have just described accounts for the ability of the circuit to pro ‘:d voltage regulation. When Vo decreases, VB£ increases, which causes the NPN transi tor to conduct more heavily and to produce more load current. The increase in load current causes an increase in Vo since Vo ~ ltRL For example, . suppose the regula or supplies 1 A to a 10-0 load, so Vo = (1 A)(10 0) = 10 V. Now suppose the 10 \d resistance is reduced to 8 O. The output voltage would then fall to (1 A)(8 0) ::::.8 V. However, this reduction in Vo causes toe transistor to’ conduct more heavily, and the load current increases to 1.25 A. Th ,taa output voltage is restored to Vo = (1.25 A)(8 0) = 10 V. The regulating action is similar when Vo increases: VBE decreases, transistor conduction is reduced, load current decreases, and Vo is reduced. Notice that the transistor is used essentially as an emitter follower. The load is connected to the emitter and the emitter ‘follows the base, which is the constant voltage. 3. the current in the 200-0 resistor. 1. From equation 17-37, Vo = Vz – VBE = 12 V – 0.65 V = 11.35 V.
2. 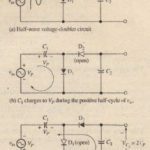 By writing Kirchhoff’s voltage law around the loop that includes, Va, and Vo, we find Va = Viti – Vo = 20 V – 11.35 V = 8.65 V.
3. The voltage drop across the 200-0 resistor is V•• – Vz = 20 V – 12 V = 8 V. Therefore, the current in the resistor is I = (8 V)/(200 0) = 0.04 A. For successful regulator operation, ‘the pass transistor must remain in jts active region, ViII must not drop to a level so small that the zener diode is no longer in its breakdown region, and the zener voltage Vz should be highly independent of both current and temperature. Also, the feedback loop gain, from output back through the control element, should be very large, so that small changes in output voltage can be detected and rapidly corrected. Figure 17-30 shows an improved series regulator that incorporates an additional transistor in the feedback path to increase gain. Writing Kirchhoff’s voltage law around the loop containing R2, R), and the zener diode, we have Any decrease in Va will cause a decrease in V2 and, assuming that Vz remains must therefore decrease .A decrease in VIlf: cause~ Va to increase, since 02 is an inverting common-emitter stage. Since the voltage VII on Q. experiences this same increase, O. conducts more heavily, produces more load current, and increases V,,, as previously described. Another way of viewing this feedback action is to recognize that a decrease in V8£1 causes O2 to conduct less, and therefore allows more base current to flow into 0,. Of course, any increase in Vo causes actions that are just the opposite of those we have described and results in less load current. how an operational amplifier is used in a series voltage regulator. Resistors R, and Rz form a vo1ta~e divider that feeds a voltage proportiona I to v” hack t the inverting input: V = V”R2/(R, + R7)’ The zener voltage V7. on the noninvcrting input is greater than V-, so the amplifier output is positive and is proportional to Vi( – V-. If V” decreases, V- decreases. and the amplifier output increases. The greater voltage applied to the base of the pass trnnsistor causes it to conduct more heavily, and V” increases. Similarly, an increase in V” en uses V to increase, Vi: – V – to decrease, and the amplifier output to decrease. 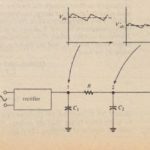 The pass transistor conducts less heavily and V” decreases. The-operational amplifier in Figure 17-31 can be regarded as a nonillverting configuration with input V7. and gain. Design a series voltage regulator using an operational amplifier and a 6-V zener diode to maintain a regulated output of 18 V. Assume that the umcgutated input varies between 20 V and 30 V and that the current through the zcner diode must be at least 20 mA to keep it in its breakdown region.